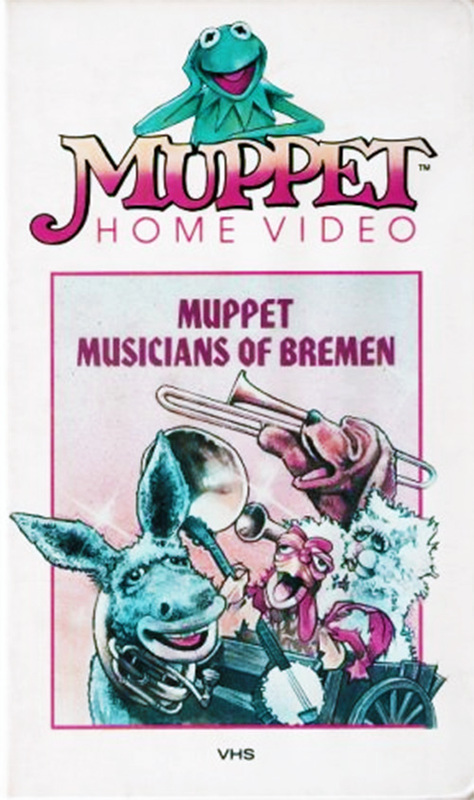 Fairy Tale Media Fix: The Muppet Musicians of Bremen. Well, I said I’d talk about a Muppets adaptation of a classic fairy tale, and by Grimm I will! Like I’ve said before, there were three distinct adaptations I remember being run on syndicated television when I was younger. 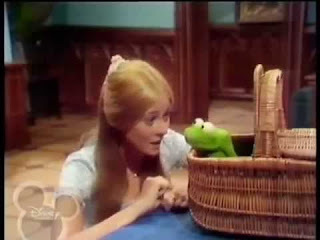 There was The Frog Prince (1971), Hey Cinderella (1969) and The Muppet Musicians of Bremen (1972). Now, while the first two have their charms, I thought I’d focus on the last one right now. Mainly because it’s kind of a distinctive work compared to the other two. While Frog Prince and Hey Cinderella both feature fairly big parts for Kermit the Frog and other fairly well-known Muppets characters, Muppet Musicians of Bremen largely focuses on Muppets that are mainly known through this special. Kermit does appear, but only to introduce the special and close it out as well as a very brief guest spot. It’s also the only one that changes the setting of the tale away from a generic European fairy tale kingdom and to rural Louisiana. First, a little about the fairy tale itself. “The Bremen Town-Musicians” is a short but rather distinctive tale from the Grimms’ collection. In terms of popularity, it’s kind of a middle of the road tale. 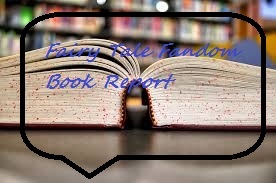 More well-known than stories like “Simeli Mountain” or “Faithful John”, but not as popular or famous as tales like “Snow White” and “Rumpelstiltskin”. The story follows four aging farm animals, a donkey, dog, cat and rooster as they run away from their respective owners who are planning to do them in. They decide to head to the city of Bremen and become musicians. Along the way, they run across a house full of thieves who the animals scare away. Rather than go on to Bremen, they decide to live out the rest of their lives together in the house. The Muppet version starts out, per Kermit’s introduction, somewhere in the countryside of Louisiana a ways from the towns of Bremen and Gogalala. We open on a short-tempered thief named Mordecai Sledge and his aging donkey Leroy as they return home from a job Mordecai and his gang were pulling in a train yard. Having rushed out without checking what he was unloading from the boxcars, Mordecai is steamed to find out he had just stolen a load of musical instruments. Without any means to rationally express his anger, he blames Leroy and goes to get his gun to “retire him proper”. At this, Leroy decides to hoof it, which results in a comedic sequence that involves Mordecai screaming incoherent obscenities, getting his foot caught in a bass drum and Leroy getting a tuba stuck round his neck as he runs off. After a short talk with Kermit the Frog (I told you he was in here as a guest star), he decides to head off to Bremen as a travelling musician. Along the way, he meets three other animals with stories similar to his own. There’s T.R. the rooster, who’s on the run from the gluttonous farmer Lardpork who’s out to kill and cook T.R. for not crowing to wake him. Rover Joe the hound dog, cast out by his cowardly and superstitious owner Mean Floyd. Then there’s Catgut, a lady cat who was almost drowned by her cruel and selfish master Caleb Siles for making friends with the rats. Together, they set off with a cart full of instruments to become travelling musicians. Our erstwhile band soon gets lost in swamp country. They soon come upon a house where all their ex-owners, who just happen to be Mordecai’s gang, are meeting to split up the loot from several robberies. Both groups experience a case of mistaken identity. The animals, just looking at silhouettes through a window shade, mistaken the thieves for a loving family. The robbers, hearing the animals’ noises and prodded on by Mean Floyd’s natural superstitiousness, mistaken the animals for a bunch of assorted swamp demons. This leads to a conflict in the darkened house wherein the animals try to save the “beautiful family” that they think is in trouble and the robbers get scared off by what they think are swamp demons. And so the robbers run off to never be seen again and the animals live in the house where they can continue to play music together. It’s a rather fun special. The plot matches pretty well with the original fairy tale. The changes that are made are either inconsequential or actually make the experience of watching the special a little better. Probably one of the best changes was making the Musicians of Bremen into actual musicians. In the Grimms’ tale, it just seemed like the old animals were a bit deluded. In the Muppet version, despite having pretty much no time to learn how to play and practice, they show some impressive chops pretty early on. So, with Leroy on tuba, T.R. on banjo, Rover Joe on trombone and Catgut on trumpet, the quartet produce some very fun, catchy tunes. True to the special's new Louisiana setting, there are definite jazz and country flavors to the songs. One other change, making their four owners into the same robbers they chase off, does have some pros and cons. On the con side, it removes some of the brutally honest context of the animals’ reason for running away. It wasn’t uncommon at one time for farm animals to be valued only for the work they could do and the food they could become. Donkeys pulled wagons. Cats killed rats and mice. Dogs hunted or guarded the house. Roosters crowed and mated to produce more chickens. If they couldn’t do that work anymore, it was often seen as necessary to put them down rather than let them become a burden. So, the owners in the written version of the tale weren’t necessarily bad people. They were just doing their jobs. By making the owners into a band of thieves, the whole thing is cast in another light. On the pro side, it provides a sort of economy of storytelling. It also gives the story some more established villains to root against. Overall though, I like it. I’d give the Muppet performers lots of credit. They always do a good job bringing characters to life. Each of the animals has their own personality that comes across well. Leroy is an optimistic dreamer, T.R. is a charmer to the hens and has a bit of a dry sense of humor, Rover Joe is soft-hearted but slow on the uptake and Catgut is a bit dramatic. 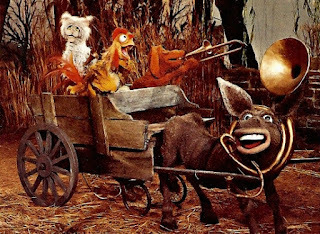 All the animal puppets are designed to look old and worn out like the aging farm animals they’re supposed to be. As for the human-sized puppets that play the villains, they can be a little surprising at first. 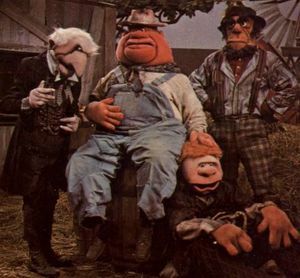 Over time, it would become a common practice to have the Muppets interact with actual human actors if they needed human characters. But not here. The puppets/costumes here have a sort of caricatured ugliness to them that is comical once you get used to it. If you’d like to see it, don’t go looking for this special on DVD. It was never released on one. However, someone has uploaded the whole thing onto YouTube. Apparently, whoever owns the copyright now (probably Disney, because they own the Muppets) doesn’t seem to care about people watching it there because it’s been there forever and is easy to find. But I think I’ll end with a song from the band itself. Play us out, Leroy! Folk Tale Secret Stash: Moshup the Giant. I know I said that I would post more Muppet stuff this week, but I think it’s best to let that one sit for a while and we can come back to it. You see, I wasn’t really planning too far ahead and didn’t realize that Thanksgiving was coming so soon. Thanksgiving is a complicated holiday in the grand scheme of things. And I don’t just mean because not everyone gets along with their relatives. The holiday as we know it today actually stems from the 1860s when a prominent writer and magazine editor Sarah Josepha Hale (the woman who wrote the children’s poem “Mary Had a Little Lamb”, I kid you not) lobbied the U.S. government to create a national Thanksgiving holiday. Thanksgiving holidays were nothing unusual in the early U.S., but they varied from state to state. President Abraham Lincoln, though, saw the potential in having such a day after some major Union victories in the concurrently happening Civil War and turned Hale’s idea into a national holiday. However, that’s not the story we attach to Thanksgiving. Instead, we tell a story about Puritans and native Wampanoag people sitting down at this great big feast in Plymouth which became known as the “first Thanksgiving”. There was a feast like that, too. Granted, it happened two months earlier in September and the main course was venison rather than turkey. However, looking back at that feast it’s hard not to just look at it and see it as, well . . . a precursor to genocide. The native people of this continent have not been treated well. Heck, they’re still not treated all that well. Things like “paper genocide” deny people their heritage. The U.S. government continues to break treaties made with native peoples. Not to mention the poverty often found on reservations. What can we do to make things better? Well, a good place to start might be to embrace their stories. After all, nothing brings people closer together than sharing stories. 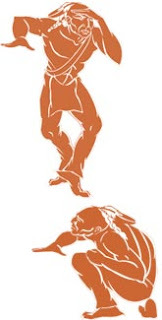 Which brings us to the character of Moshup the Giant. Moshup is a culture hero of the Wampanoag and Mohegan peoples, the same tribes that lived in the area of Plymouth before the Puritans showed up. Stories vary on the exact details regarding Moshup. However, most of the versions I’ve read say he lived on the island of Martha’s Vineyard near a town now called Gay Head. There is even a crater there, where it’s said that Moshup sat. Like many culture heroes, Moshup’s actions shaped the very landscape. Moshup liked to eat whales. He would catch the whales with his bare hands and then roast them over a fire made from the trees that he would rip right out of the ground. In order to get out into the water where the whales are, he threw stones out into the water to stand on. These stones still exist, spanning the between Cuttyhunk and the mainland. Today, they’re called the Devil’s Bridge. He was a great friend to the local people. He would share his food with them and they would share their tobacco with him. One year, the Wampanoag people gathered up all the tobacco they had harvested in a year and gave it to Moshup in appreciation of all he had done for them. Moshup smoked the tobacco, which was barely enough for someone of his size, and then emptied the ashes into the ocean. The ashes became the island of Nantucket. Another story tells of how Moshup once fought and killed a great man-eating bird monster. He waited until the bird seemed to get close enough to rip out his heart with its talons and then grabbed the killer bird and wrung it’s neck. It was shortly after that Moshup met Squant, the sea-woman who would become his wife (well, second wife. He had some trouble with the first one). Though there are bound to be variations, pretty much every version of the story I’ve found ends with Moshup leaving. He slips into the bay or leaves for some cave somewhere. But before he goes, he warns the Wampanoag and Mohegan peoples that a strange breed of man with pale skin would come to their shore. He warned that they should not let the pale people come ashore, for if they did then their people would be no more. And you know, he was pretty much right. 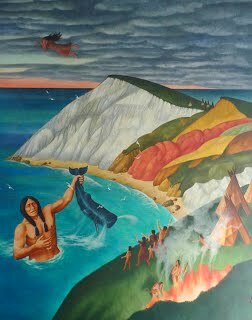 Though Wampanoag and Mohegan people still exist, their way of life was never really the same after those pale people came ashore. It still isn’t and the U.S. government still tries to screw over these people. Just this year, the Department of the Interior issued a decision in which it refused to reaffirm its own authority to confirm the status of the Mashpee Wampanoag Reservation. This could pave the way for the reservation to be taken out of trust, which is bad news. Millions of dollars in funding are being lost or delayed that are needed for education, clean water programs, emergency services, housing and substance abuse programs. If you want to read more about the Mashpee Wampanoag Reservation and their legal troubles, you can go to their web page or look for the hashtag #standwithmashpee on Twitter. There’s even a link to the law they want to get passed. I’ll also give you a link to where I got some of the Moshup stories if you want to see more. This Thanksgiving, enjoy your food and enjoy your family, but remember there are still people out there who are a huge part of the American story that still need help. It’s time to play the music. It’s time to light the lights. It’s time to meet the Muppets in Muppet Fairy Tales tonight! Oh, yeah! This is my kind of book! I’m a big Muppets fan going way back. Way, way back! How big? Well, this is what my checkbook looks like. I’m not going to show you the actual checks, but trust me they follow the same theme as the cover. The book we’re talking about is the latest in the new Muppets Meet the Classics line of children’s books. This one in particular is Muppets Meet the Classics: Fairy Tales from the Brothers Grimm by Erik Forrest Jackson. Now, this is hardly the first time the Muppets have adapted fairy tales and it probably won’t be the last. Some of the earliest Muppet productions I remember watching were Jim Henson’s The Frog Prince, Hey, Cinderella and The Muppet Musicians of Bremen. They also tackled a few fairy tales, fables and myths in a straight-to-video project called Muppet Classic Theater. Heck, when there was a license for Muppet comics at Boom! Studios, Muppet Snow White was one of the miniseries produced. But I suppose I’ll deal with those another time. Now, while this is not the first time adapting (and lampooning) fairy tales, it is the first time they’ve gone quite this deep. They’re focused on just one historic fairy tale collection this time and are adapting 18 stories both popular and obscure. The thing is, is it possible to catch the trademark humor and warmth the Muppets are known for on the printed page? Even some of the modern TV Muppets productions haven’t quite measured up. The book is set up as a sort of performance by the Muppets. Essentially, they know they’re in a book. There are a prologue and an epilogue that deal with the times before and after said performance when the Muppets are preparing or winding down and can be themselves rather than their characters. Sometimes they break the fourth wall during the tales. Sometimes, stuff from one tale will bleed into another, usually in the form of a running gag. Really, it’s just a very funny book. Jackson captures the traditional Muppets humor very well. 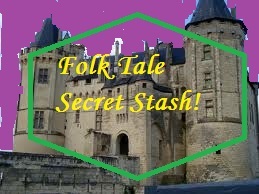 Sometimes he’ll work the joke into fairy tale fiction staples like fanciful ways of saying time passed. A regular fairy tale fantasy might describe the seasons passing. In the book’s first story, it’s done like this: “Time passed. The snow fell. Britney Spears had another comeback, fell from favor yet again, and came back once more”. The Muppets, being the big zany showbiz family that they are, are going to poke fun at show business. The writer knows this. The Muppet version of Rapunzel takes place in Las Vegas and their version of Dame Gothel (played by Miss Piggy) is a witch who works as a stage magician. In their version of “The Fisherman and his Wife”, the greedy wife played once again by Miss Piggy wishes for a mansion but also starts wishing for a number of entertainment awards like the Oscars, Grammys and Emmys. She even muses on the possibility of wishing for a Newberry Medal (given for excellence in children’s literature). Kermit then responds that it’s not going to happen for this book. All of it’s done with the typical lighthearted optimism the Muppets are known for. Usually, around this point I’d talk about the writer’s choice of tales to adapt. I do want to do that. However, I also want to talk about the choice of Muppets he makes. In terms of the stories, most of the more popular tales from the Brothers Grimm are here. There are “Cinderella”, “The Frog King”, “Rapunzel”, “Little Red Cap”, “Snow Drop”, “Rumpelstiltskin”, “Hansel and Gretel”, etc. And that’s fine. The majority of people want to see the old favorites. However, there are also a lot of less famous tales adapted here. There’s “Simeli Mountain”, “The Cat and the Mouse Set Up House”, “The Giant with the Three Golden Hairs”, “The Mouse, the Bird and the Sausage”, “The Golden Goose” and others. Probably my favorite of those adapted is “Faithful John” which gets adapted as “Faithful Sweetums”, with the Great Gonzo in the role of the prince and of course the towering but ultimately kind-hearted ogre Sweetums in the title role. And that brings me to another thing. A character like Sweetums usually plays background roles. He’s around if the Muppets need a big, powerful, scary full-body Muppet but he’s not usually the star. But Jackson doesn’t really let that stop him. He digs deep into the Muppet cast and pulls out characters you might not expect and often gives them starring roles. This is a very good thing. Why? Well, let’s just admit something here. If you reduced the Muppets down to just their most prominent characters, you would only have one female character. That character is the one, the only (thank goodness) Miss Piggy. It’s been an issue before. In both the original Muppet Babies cartoon and the new series, they had to create new female characters just to diversify the cast. In the ‘80s it was Scooter’s twin sister Skeeter. Today, it’s a character named Summer Penguin. The stories collected by the Brothers Grimm have many, many prominent female roles in them. Can you imagine if every princess, witch, peasant girl and crone in these stories had to be played by the same self-absorbed pig. Yikes. From the first story, you can tell that’s not going to be a problem. It’s Jackson and the Muppets’ take on “Cinderella” (or “Ashputtel”) and while Miss Piggy does end up taking the role of the Wicked Stepmother, the Cinderella role goes to Camilla, Gonzo’s chicken paramour. That’s not all, either. Janice, the Electric Mayhem’s guitarist, plays both Snow Drop and Rapunzel (just a refresher: “Snow Drop” is another name for Snow White). Also, one of the rats, Yolanda, plays the book’s Sleeping Beauty. Sometimes they just gender-bend the roles, like having Fozzie play Little Red-Cap or having Andy and Randy Pig play the wicked stepsisters in “Cinderella”. Piggy still has a lot of work, though. She’s the princess in “The Frog Prince” as well as various villainesses and other assorted roles. And that’s just a few of the Muppets you’ll see in this book. Overall, this book is just a load of fun. It’s fun for fairy tale fans. It’s fun for Muppet fans. It’s fun for people who just like send ups of fairy tales (like Shrek or Fractured Fairy Tales). I’d recommend reading it. If they’re all like this one, I hope the Muppets Meet the Classics line has a whole lot of success. 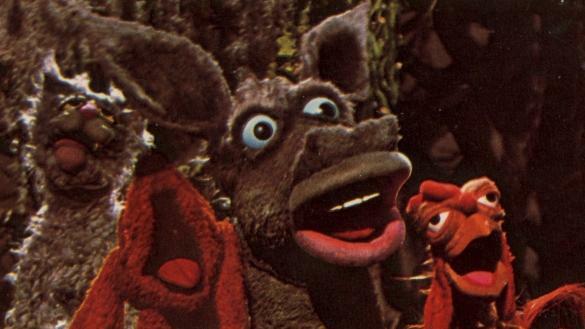 You know, I could probably talk about Muppet fairy tale adaptations for a long time. But alas, that is something for another time. Like maybe next post. 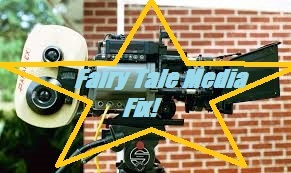 Fairy Tale Media Fix: The Nutcracker and the Four Realms. The Nutcracker? 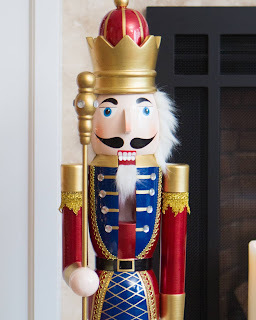 I already did a post on the Nutcracker a couple Christmases back, remember? Oh, you mean the new movie? Well, it wasn’t good, if that helps. Okay, The Nutcracker and the Four Realms is a new live action Disney fantasy film released this year. The film focuses on young Clara Stahlbaum who has just lost her mother for undisclosed reasons. She is given a mechanical egg with no key as a posthumous Christmas gift from her mother and has to set about finding a way to open it. Later, at a Christmas party thrown by her godfather Droselmeyer (who also happens to be the man who raised her mother), she finds her way into another world where the key is only for it to be taken by a mouse. From there she discovers that her mother was once queen of this world and meets friends like the Sugarplum Fairy and the Nutcracker Soldier as well as running afoul of Mother Ginger, the ruler of the dark and creepy Fourth Realm. As far as takes on public domain fantasy stories go, this one feels a little dated. It feels more like something akin to the Tim Burton Alice in Wonderland or Snow White and the Huntsman from almost a decade back. Most of the story is given over to giving Clara a coming of age narrative and turning her into a borderline action hero. And while it’s not bad to have a female empowerment fantasy (perish the thought), I was hoping for a little more from it. Also, like Alice and Snow White in those other movies, Clara’s importance is created in a rather convenient manner. Only, instead of there being a prophecy with her as the Chosen One, she’s secretly the old queen’s daughter. Every other character in this movie either gets swallowed up by the production or acts so over-the-top that it seems like they’re afraid they would be if they didn’t command as much attention as possible. 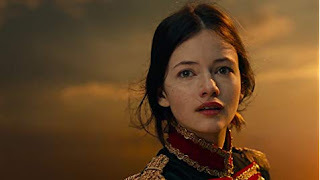 For example, the character of the Nutcracker himself is demoted to more or less the position of Clara’s sidekick and isn’t much more than that. Meanwhile, the Sugar Plum Fairy portrayed by Keira Knightley chews the scenery so much you’d swear she thought it was actually made of gingerbread. The tone kind of varies from moment to moment. One minute it’s more of a bright alternate world fantasy, the next it’s more of a creepy pseudo-Tim Burton thing, the next they’re talking about magical machines that bring toys to life and it feels like something out of the Spy Kids franchise. I think where the movie really goes off the rails is when they indulge in another more modern Disney-Pixar trope and have a plot twist as to who the real villain is. I’m not going to reveal who it is, though click HERE if you want the spoiler in music form. I will tell you that it’s not the Mouse King, the usual villain of the Nutcracker story. The Mouse King in this version is this big mass of mice that take the form of a giant mouse and his role is decidedly different than it is in any other version of the Nutcracker. I mean, there are some bright spots. The ballet scene starring Misty Copeland is very good. The focus on grief is interesting and does inform the performance of the surprise villain a little bit, though not enough to save that twist. And, as usual, it’s fun to pick out the nods to the original works. 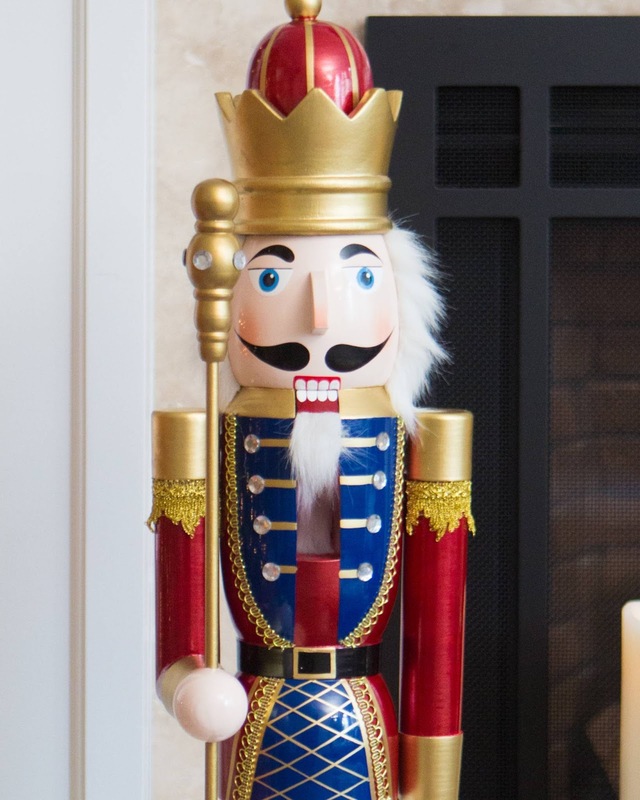 For example, the Nutcracker is named Capt. Phillip Hoffmann after the original book’s author E.T.A. Hoffmann. Also, Clara’s mother is named Marie Stahlbaum, which was the name of the Clara character in Hoffmann’s book. But that’s about it. You know, maybe I’m on the wrong track, but I don’t really see much value in making Clara nee Marie into royalty. In E.T.A. Hoffmann’s story, if I recall correctly, Marie was special because of the kindness she showed to the Nutcracker and because she had the fortitude and good aim to chuck her slipper at the Mouse King’s head. I know it’s kind of a cliché to make a female character’s greatest trait kindness, but as I get older I start to think that kindness may be a trait that’s far greater for anyone than cleverness or any trait associated with derring-do. 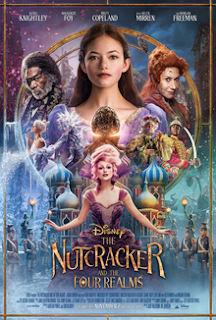 And I find myself wondering once again how useful a radical new take on The Nutcracker and the Mouse King is when it’s never, at least to my knowledge, had a definitive movie adaptation in the first place. I mean, sure, the ballet adaptation gets performed every year around Christmas. Ballet isn’t for everyone, though. Some people have trouble interpreting the dance they’re seeing into the story that’s supposed to be conveyed. And some people don’t really go to the ballet and only know Tchaikovsky’s music. And while I would love a more faithful adaptation of The Nutcracker and the Mouse King, I’m realizing that it would probably be a very difficult story to adapt. It has that whole “story of the hard nut” in the middle of it and a good chunk of the last third is just devoted to showing off the peculiarities of the Land of Sweets. I’d still like to see them try, though. This is also a reminder that during Disney’s big live action fantasy trend, that while they’ve done pretty well with all their remakes and reimaginings of their own past movies, almost every time they have tried to do something outside that area it has failed to stick the landing. So far, we’ve had Oz the Great and Powerful, Into the Woods, The BFG, A Wrinkle in Time and now The Nutcracker and the Four Realms. Of all of them, I’d say Into the Woods was the best and you’d have a very different opinion if you asked a theater buff. Oz the Great and Powerful I find watchable but very flawed. A Wrinkle in Time is pretty much the best you could expect from an adaptation of a nearly unadaptable book (it carried the story okay, but it didn’t convey the interesting philosophical and scientific ideas that blew our minds in fifth grade very well). The BFG was just “meh”. And now we have this Nutcracker thing. So, Walt Disney Pictures may have some trouble ahead once it runs out of adaptable stuff in its own back catalog. Anyway, If you’re looking for some kind of Nutcracker fix this holiday season, you’re better off just going to see a local ballet performance. Or better yet, read the original story by E.T.A. Hoffmann. You can find it online HERE. 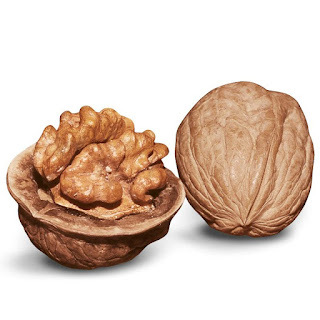 Anyway, care for a walnut?